Local Drain Care Company, Metro Rod Cambridge, experts in unblocking the city’s drains wondered why Cows are allowed to roam on the City’s grassed areas of common land – it certainly adds to the wonderful quirkiness and diversity in Cambridge! 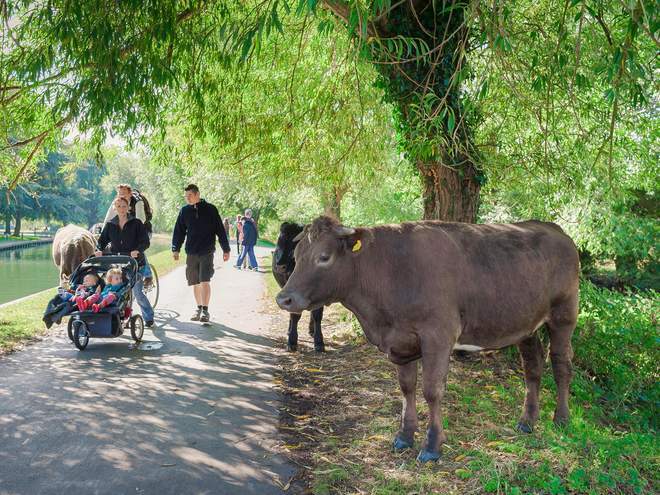 Cambridge’s urban cows are a throwback to when local residents used public spaces to graze their cattle. These days they do draw attention and of course some criticism! University staff are used to red deers meandering across their evening commutes. “It gives a sense of rus in urbe, which means rusticity in town,” says a Cambridge University librarian. Approximate 120 cattle roam amid the city parks and gothic towers of this medieval university town and, stepping over the cow pies, the human residents profess an improbable pride in the local bovine neighbours. Early residents of what is now Cambridge built a gravelly island in a marsh area about 50 miles northeast of London. Where the land was too low and too wet for building or farming, they used shared fields to graze their animals. Common land however began to come under siege about 400 years ago, as the gentry pushed to enclose more land into private properties. In the area around Cambridge, wealthy landowners hired Dutch Engineer Cornelius Vermuyden to drain the marshland for arable farmland, arousing violent resistance from locals who had depended on the wetlands for fishing, fowling and hunting. In Cambridge however, the cows held on to their ground. The urban herds became yet another emblem of the city, like the white-robed boys’ choirs singing in the college chapels or the flat-bottomed boats of picnickers crowding the river. As the human population has grown to 130,000 with an influx of Scientific and Tech companies as well as wealthy commuters, the cattle have taken on “this iconic status now”, said Susan Oosthuizen, a Cambridge historian. “Because seeing cows is certainly not what we expect in a 21st-century urban environment.” Some environmentalists complain that common use rights are a scourge on the British countryside. The cattle save the cost of lawnmowing. They munch the grass in a variety of heights – a pattern known to horticulturalists as Diversity of Sward – which fosters biodiversity and provides huge benefits. Beetles that feast on the cow dung are a treat of birds, bats and other animals. Metro Rod Cambridge are very used to quirkiness and Cow Pies!!! We provide drainage services for both residential and commercial customers. Famously known for our reactive services – blockages and high pressure water jetting to name a few. We of course offer far more than this – CCTV Drainage Surveys, Electro-Mechanical Cleaning, Drain Repairs which include no-dig techniques and excavations. Tailored pre-planned maintenance is a speciality of Metro Rod Cambridge. Complex drain management will include Fats, Oil and Grease clearances.